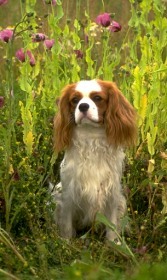 Don't get me confused with the King Charles Spaniel (English Toy Spaniel). I am a little bigger than he is, and his head is more rounded on top than mine is. I am also one of the largest of the toy dogs. My breed was developed in an effort to preserve the Blenheim Spaniels of the "Old Type" and we were first registered with the British Kennel Club in 1944. My people parents say that I am the most loving and affectionate little dog that they have ever seen, and I do try my best always to live up to their expectations. I mind beautifully, I am not spoiled, and I am very polite to everyone. We Cavaliers come in four colors: Blenheim (red/white), which is what I am; Black/tan; Ruby (solid red, with no white); and Tri-color (Prince Charles). I like to go outside with my people parents to play for a while when the weather is nice, and they take me lots of places with them in the car, but I am strictly an "indoor dog". If you are looking for a small doggy companion with a wonderfully sweet personality who doesn't need a lot of grooming talent, look no further! When fully grown, I am between 12 and 13 inches tall (30.5 to 33 centimeters) and I weigh between 12 and 17 pounds (5.4 to 7.7 kilograms). See Cavalier King Charles Spaniel Breeder listings below. Click here to place your Cavalier King Charles Spaniel Ad! We are an ethical and responsible small breeder of quality AKC registered Cavaliers of champion pedigrees with an emphasis on health, temperament, and the classic beauty of the Cavalier King Charles Spaniel.